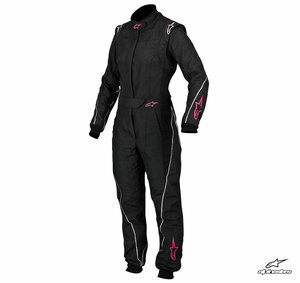 The new 2013 Alpinestars Stella GP Pro ladies race suit, re-designed for the new season, using Alpinestars unique form fit shaping for optimum comfort. This latest suit features a lightweight 3 layer construction with a PBI/Nomex inner layer which offer increased protection against fire and heat. 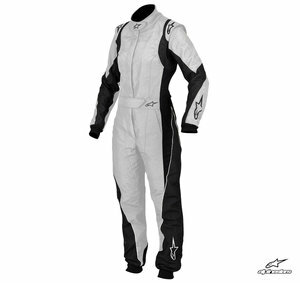 The remaining layers utilise Alpinestars excusive lightweight elastic fabrics, producing a very comfortable well fitted suit. The suit also features anatomical side and lower back panels which increase mobility and breathability. Pre-shaped fully floating arms, coupled with pre-shaped legs provide a freedom of movement and enhanced comfort in the ergonomic driving position. Finished off with exclusive HANS friendly epaulettes. 290g/m²FIA 8856-2000 approved.